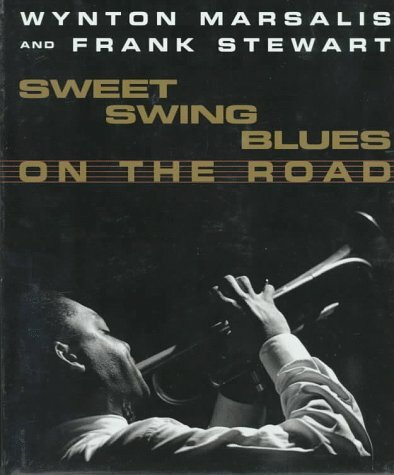 Sweet Swing Blues on the Road by Marsalis, Wynton;Stewart, Frank: W W Norton & Co Inc 9780393035148 Hardcover, First Edition., Signed by Author(s) - Vagabond Books, A.B.A.A. Jazz and classical musician Marsalis's free-ranging text includes characterizations of the musicians in his septet, breezy descriptions of places where they perform and snippets of their lively banter, while Stewart's 140 b&amp;w photos offer a behind-the-scenes look at the performers, their families and their audiences. The book conveys the nervous energy and fast pace that characterize the lives of musicians on the road and includes trenchant accounts of conversations with young followers who want to become musicians. Marsalis's advice is always the same: practice. The self-consciously hip writing, however, becomes incoherent when he discusses his views on romance, politics and the history of jazz. The book will appeal primarily to those who consider Marsalis, a trumpeter and artistic director of Manhattan's Jazz at Lincoln Center, an icon. Author tour. <br />Copyright 1994 Reed Business Information, Inc.